You can get a free pint of beer from a *mysterious brewery* which has decided to strip its pints from branding to prove the beer speaks for itself. 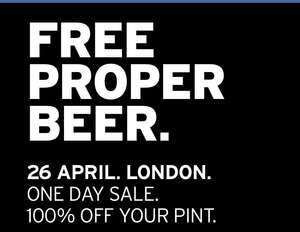 What that essentially means is that you can get a free pint from said *mysterious brewer* from over 200 pubs in London (sorry everyone else!) on April 26th. But you have to register for it so you get an individual code. Deal posting newbie! This is Casiolynn first deal post. Help out by leaving a posting tip or just to show your appreciation for their contribution.